If you are one of the people undertaking millions of searches for gift ideas for just that right gift for a variety of gift-giving situations you are in good company. But it is good to search.People like getting gifts and presents, but not a boring one or a present that has had no thought put into it!! Today you can use one gift idea for many gift giving situations. This is a gift that can be tailored for just about any gift need, and totally different each time and not like a gift that anyone else has every received! This amazing one idea for many uses is our custom humorous artwork. People may call them many different names, cartoons, caricatures, commissioned art, portraits, indie art and more. It may seem an odd, but custom art is a great as a corporate gift to commemorate a business deal, be it a new contract or joint venture, an amalgamation of two business, or even a renaming of a corporation. Commonly the picture features the key players (two or more people) and a quirky take on the occasion. The quirkiness can be inspired by some tongue-in-cheek identification of a humorous aspect about either the personalities, the process ofthe businesses. That is one of the benefits of ordering a customized art corporate gift – it is totally unique. Many business are seeing the ongoing benefits of recognizing staff who put in extra efforts in their job. Your staff award can be a monthly or quarterly award, or ad-hoc award on occasions out outstanding effort. Custom art for a staff award can be fun or serious, and can invoke some traits of the person involved in the workplace. This caricature of the person provides a welcome deviation from the normal day to day gift style and one that will have both a place on the award wall at work and at home. 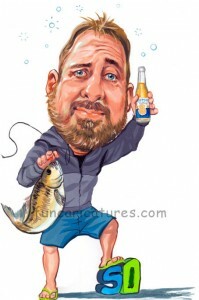 Birthday presents are a big opportunity for a caricature, cartoon or other form of personalized art. There are the big birthday gift occasions such as 18th, 21st, 40th, 50th etc. Typically the approach is to show the person doing what they love best – so they could be mountain climbing, with a sport team jersey, fishing, golfing, with their car etc. As a memento of that age, nothing is better than bespoke art gifts! Presently there are thousands of service personnel returning home. What better way to commemorate this hugely welcome event than with your own unique artwork! Get a hand-drawn artwork that either features just your returning service person, or with family with them in uniform. Using several pictures, a whole new joyous scene can be created to that what you want can be depicted perfectly. Teams are special. Work team, sports team, military squad… teams work towards a common goal and as a result form a special bond and what better way than to recognize this bond with a one-of-a-kind image! Every individual has their special traits, and these combine to make up what the team is. You cannot capture these traits in a photograph the same way you can when you have a professionally drawn team giftthat can capture the scene, poses etc that you want. Supplying several photos, instructions is often all that is needed to get a team gift to remember!! You are invited to a wedding, but what to buy? The wedding registry site they have provided has stuff that is, well… mundane! By accessing photos of the couple and with your knowledge of their relationship, you can give the happy couple a wonderful; wedding portrait style artwork, that can have love and humor at its very core and will provide an instant decorating item for their home. Years of effort goes into graduating, be it from college, university, military training or any other training where your completion is officially recognized. Who wants a stuffy official portrait when it is a time for celebration! A custom graduation giftis the way to go. Make it fun, make it zany, make if formal bun fun (even little subtleties can inject humor). Graduation is a time of happy emotion – capture it!